The spacious living room is decorated with bright Floridian accents and provides the perfect environment for indoor relaxation, day or evening. The seating area provides both a three-seater sofa and a two seater in addition to a matching deep cosy armchair. A 32" ultraslim LCD TV with integrated DVD provides the stunning picture quality with which to enjoy the extensive programming of the inclusive Brighthouse cable service. The service includes the facility to delay / record and play back programmes at any time ensuring that after a full day at the parks you are assured of catching your favorite show. Rooms have been accessorised throughout with great attention to detail ranging from pure silk drapes to artwork, mirrors, pottery and glassware displayed to enhance your vacation experience. Step out from the family room under the covered patio and on to the expansive pool deck, which surrounds the sparkling clear pool featuring a luxury spa cascading into the main pool. Make sure to use plenty of sun-screen - as this pool deck is the perfect tanning spot. 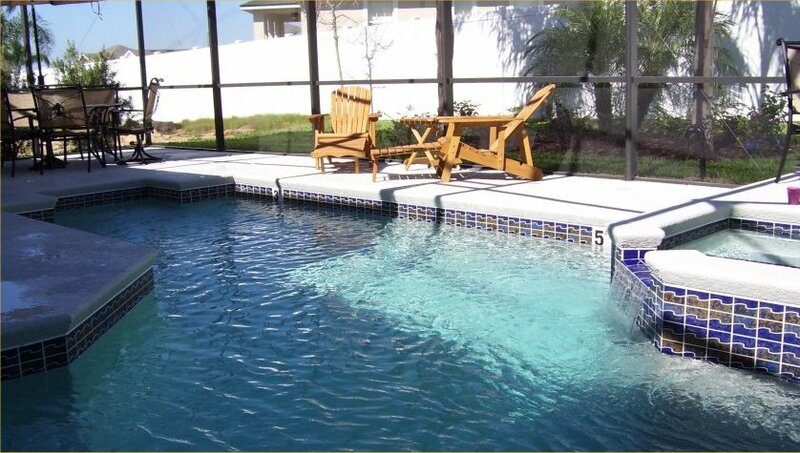 Sit and relax either in the shade on the comfortable upscale patio furniture [including swivel rockers] or at the back of the pool on one of the classic Adirondack recliners, as you soak in the Florida sunshine. The pool area is provided with a removable safety fence offering added protection for young infants should you need it. Sleeping accommodation at our villa includes two master bedroom suites, each with night-stands with lamps, clock/radio/alarm, dresser with LCD TVs offering cable & DVD, walk-in closet space and master en-suite bathrooms. One bathroom has his 'n' hers mirrored vanity basins, large shower, roman-style tub, and separate toilet. The other has a large shower, single basin and toilet. The other two bedrooms are each provided with twin beds and a nightstand and lamp, clock/radio/alarm, dresser and large built in wardrobes. These two bedrooms are adjacent to the third [shared] bathroom, which incorporates bath, over bath shower fixture, basin and toilet. 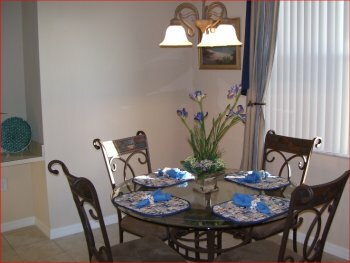 Each bedroom has its own TV offering cable service and a DVD player. One of the TVs also has integrated VHS. There is a further 26" TV in the den area together with a sofa, which can be quickly converted to a very comfortable queen size bed, and a side table with lamp. A small DVD library is provided in the living room and if you forget your favourite DVDs from home, there is a Blockbusters just around the corner. 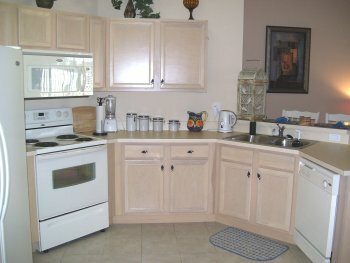 The kitchen is extremely well equipped with oven, microwave, double fridge freezer with ice and water dispenser, coffee maker and all the cooking equipment, crockery, cutlery and implements to satisfy even the cordon bleu cook. Everything you need if you do decide to take a break from the limitless dining out options within a short drive of our home. 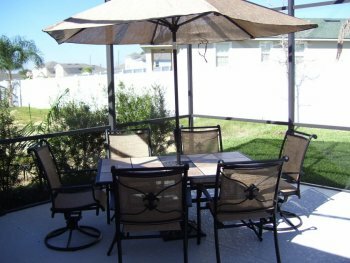 All you need to do then is decide where you want to eat: poolside, either under the covered patio or under the generously sized umbrella at the patio dining table or in the sun, or alternatively inside, more formally, in the café style dining area. You are spoilt for choice! If you still have some energy left when you come back from the parks there is a large fitness and games room, which has high quality fitness equipment, including · NordicTrack exercise bike incorporating a motivational console with 8 pre-programmed workouts and a 7x10 LCD Matrix display tracking speed, time, distance, calories, carbs, pulse, resistance and RPMs · ProForm Treadmill Crosswalk with ProSoft Plus™ Cushioning to reduce impact and a speed range up to 10mph · Full Size Pool Table that converts to Ping Pong Table · Cushioned Pilates mat · Electronic Dartboard · Multifunction games table which converts to play Table Football (Foosball), Air Hockey, Pool amongst others Free Wireless Internet Access is available throughout the house. There is a fully equipped utility room with washer, dryer and ironing facilities and an initial small supply of washing materials is provided. 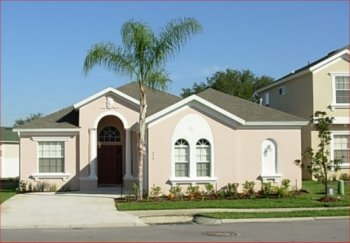 Hair dryers, one per bathroom, and a high chair and cot / playpen are also provided. .
Calabay Parc at Tower Lake, is a small community of stunning executive homes behind a magnificent gated entrance. 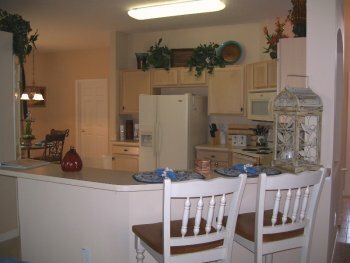 The homes are built above a natural lake with boat ramp, fishing pier/dock, water sports, a walking route around the development, and a picnic area.